Who is Britain’s new Prime Minister? You are at:Home»Regions»Europe»Who is Britain’s new Prime Minister? 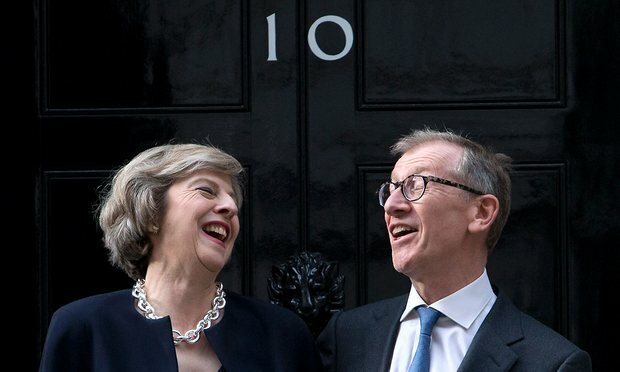 Theresa May and husband Philip outside 10 Downing Street. Image courtesy of Justin Tallis/AFP/Getty Images. Before Theresa May entered 10 Downing Street as Britain’s new Prime Minister on July 13, she spoke of her commitment to making a success of the vote to leave the EU, a decision she has promised to uphold. But who exactly is Britain’s new Prime Minister, who has made “Brexit means Brexit” her mantra? The British electorate voted to leave the EU in an advisory mandate on June 23, an outcome few had expected. The following morning, former Prime Minister David Cameron, who campaigned to Remain, announced his resignation. Politicians were left scrambling with the fallout and a divided Conservative party geared up for a leadership race. Despite initial expectations that a Leave campaigner would win, the Leave campaign’s famous faces dropped out of the contest. Eventually, May, the well-respected former Home Secretary, was the only credible Conservative candidate left standing. The way May navigates Britain through Brexit will determine far more than just her party’s future. She must protect the economic prospects of the world’s fifth largest economy, remake Britain’s legal and trade relationships with the European Union and satisfy a population divided over the country’s future. Theresa May is 59-years-old and the daughter of a vicar. Like many of her predecessors, she is a graduate of Oxford University. She started her career at the Bank of England before becoming a councillor in a London borough. In 1997, she was elected as a Member of Parliament and in 2010, was appointed Home Secretary. May was the longest serving Home Secretary in 50 years, and established a legacy of being tough on the police, strict on immigration and controversially, against Britain’s membership of the European Convention on Human Rights. May’s victory in the leadership race may have come as a surprise to many in the international community. Boris Johnson, former Mayor of London and one of the figureheads of the Leave campaign, was considered to be David Cameron’s natural successor in the event of a Leave vote. The former Justice Secretary, Michael Gove, was another prospect and for those critical of Johnson, a good “stop Boris” candidate. So how did a Remain campaigner beat Leave candidates for the position of Prime Minister shortly after a British vote to leave the EU? The new Prime Minister’s first official visit was to Edinburgh, to meet with Scottish leader Nicola Sturgeon, who has called for a second referendum on Scottish independence to avoid Scotland “being taken out of the EU against [its]will.” May promised to wait for a whole of country approach, approved by Scotland, before invoking Article 50 to trigger Britain’s exit from the EU. But it wasn’t just the Scottish who needed pacifying. Seven of the ten areas with the highest share of the votes to Remain were in London, all of which polled over 75% to stay in the EU. A party bound to business and City interests, governing from a Remain voter stronghold, could not ignore pressure to reassure voters that they would continue to protect the country’s economic interests. It is not really a surprise that three of the British government’s top four positions- Prime Minister, Chancellor and Home Secretary- are now staffed by Remainers. The biggest question now is not if “Brexit means Brexit,” but what Brexit actually means. National and international issues of importance are at stake. Is curbing migration or single market access more important? What will happen to expats here and abroad? Will Britain face long-term economic damage in exchange for greater political autonomy? How will the government satisfy the 48% who voted to Remain? Although much is uncertain, what is clear is that having a referendum has far from resolved the question. It has opened up a fight over Britain’s future which is likely to last years. In the short term, politicians must decide how Brexit will look. The government could opt for a “hard Brexit”: leaving the EU and the single market and curbing EU migration as fast as possible. Or it could choose a “soft Brexit”: entering into a long negotiation and retaining access to the single market in return for concessions on free movement. A country divided between Leave and Remain two months ago is now a country divided under slightly different labels. The success of Brexit is now in the hands of David Davis, Liam Fox and Boris Johnson. The trio are charged with negotiating Britain’s exit from the EU, including trade deals and international diplomacy. By appointing these leading Leavers, May has ensured that nobody can say a more committed team of negotiators could reach a better deal. The most important issue over the next few months is what compromise on free movement Britain, and the rest of the EU, will accept in return for Britain’s access to the single market. A compromise is unlikely to please everyone. May has skillfully passed the responsibility for this compromise onto them.